One of the best scorers in the history of NK Zagreb. Stanko was centre forward who scored lot of goals but it wasn't the brightest period in the club's history so he never got the recognition like the players who played in the following decades. He was the player with powerful and precise shot, good heading abilities and positioning in the box, good instinct for the goal. 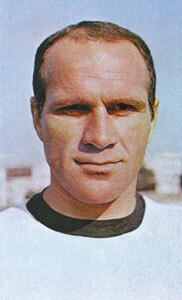 NK Zagreb footballer and coach (born in Nivičino, near Strumica, in 1937), the attacker. He played for NK Zagreb (1955-1971), and at the end of his career he moved in Trešnjevka (1971-72), one of the most efficient players in the history of NK Zagreb. He devoted himself to coaching than and since 1972 he's been working in NK Zagreb with youth sections of the club.